You look stupid in earmuffs. Sorry we’re not sorry, but there’s little worse – sartorially speaking – than seeing a stylish man undermine a well-tailored suit with fleece ear warmers. Or a beanie. Hats. Chapeaus. That’s what you want. And here’s where you should get yours: Satya Twena Hat Factory, doing custom work right now. With whiskey. 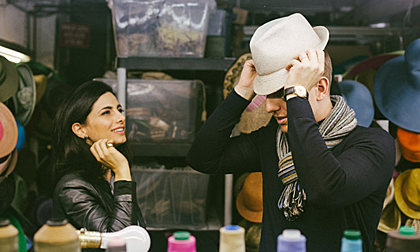 A historic factory where Sinatra once shopped, this Garment District concern was recently refurbished and converted into a millinery clubhouse of sorts. 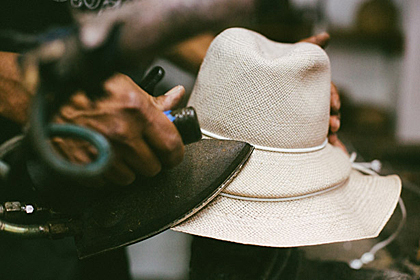 Satya Twena, your milliner-in-residence, offers packages for groups of fellas (work groups, bachelor parties, client outings) to enjoy a whiskey bar and live jazz, all while getting custom hats made. So you drink. You carouse. And one at a time, you consult with the übercute Twena on which style is for you before your headwear is handcrafted in real time. At the end of the evening, everyone leaves with a good buzz and a bespoke headpiece. Bring the hat back, gents.